As results and performances go in your 100th match in charge, Rotherham boss Paul Warne could not have asked for a much better one. 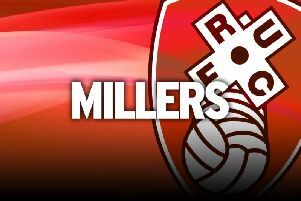 After six away defeats on the bounce this season, the Millers finally ended their away misery by putting in a fine display to earn a deserved 0-0 draw at Middlesbrough. Warne, the 15th man in the club's history reach a century of games at the helm, saw his side match their promotion-chasing hosts in every department and had it not been for Boro goalkeeper Darren Randolph, they might even have won. Their own keeper Marek Rodak also had a good game, as he was always going to have to, and made several important saves that helped the Millers register just their fourth away draw in 32 Championship away games. Warne's side have had no problems competing on the road this season and again they settled into the game at the Riverside. They had a golden chance to go in front just after 20 minutes as Kyle Vassell was set free down the left and he centred for Ryan Williams, who simply had to tap-in from five yards out, but Randolph made a great stop to block the shot. There was a sense that Williams needed to score, especially as Rodak was forced into his first save of the night immediately after as he did well to keep Martin Braithwaite's effort out. But the Millers continued to hold their own, though did see Braithwaite fire over, Britt Assombalonga just fail to connect on a cross and then Aden Flint head wide as Boro ended the first half strongly. As well as Rotherham were playing, they knew they would have some defending to do if they were going to get anything from the game and they did it manfully. And when they were breached they had a goalkeeper in Rodak who is on top of his game as a last line of defence. The Slovakian made impressive saves from Downing and then Assomobalonga, but neither of them were as good as the one Randolph had to produce to keep a curling Michael Smith effort out, with the Republic of Ireland stopper tipping the ball over from under his crossbar. The last 10 minutes was a nervy affair, but the visitors, marshalled by the imperious Semi Ajayi, held firm to cling on to a worthy point. It's been an eventful 100 games in charge of the Millers for Paul Warne, but there have not been many better performances than this.